Clarets striker Danny Ings is letting his feet do the talking as the speculation mounts over his future. Ings netted his seventh Premier League goal of the season in Saturday’s 3-2 defeat against Crystal Palace at Turf Moor - his third in as many league appearances. But he continues to be linked with a stream of clubs during the transfer window - despite the club making their position clear, that he is not for sale. Ings could walk away from Burnley in the summer, but as he is under 24, the club would be due compensation - which would be significantly less were he to leave England. However, he is just focusing on keeping the Clarets in the Premier League. Asked whether he was in talks over a new contract, he said: “To be honest, no...I’m just getting on with my football, obviously with social media and all of that outside noise, there’s going to be speculation for any player doing well for their club. 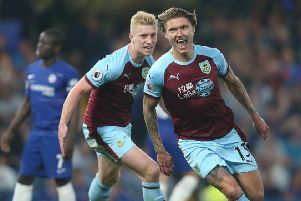 “But when I came up with Burnley, I had my mind set that I have a job to do on helping keep Burnley up. He has been described as the most wanted man in the Premier League, but the England Under 21 striker added: “That’s all behind the scenes.